OpenORE fills a significant gap in the ORE data sharing market – research data for researchers. There are several other data exchange platforms and projects out there. All are very useful and each has its own niche. OpenEI – www.openei.org – OpenEI is a U.S Department of Energy website for sharing data related to energy projects across a wide range of technologies. Users are able to upload and download independently. However, because it covers such a breadth of energy projects, there is very little on ORE and the database is not tailored to the needs or ORE users. Open Sea Operating Experience – http://opera-h2020.eu/ -OPERA is a European wave energy project which aims to collect long-term open-sea operating data from offshore and shore installed devices, delivery results for reducing structural costs and greatly increase power production, reduce technology-related uncertainties and advance standards for reducing business risk. 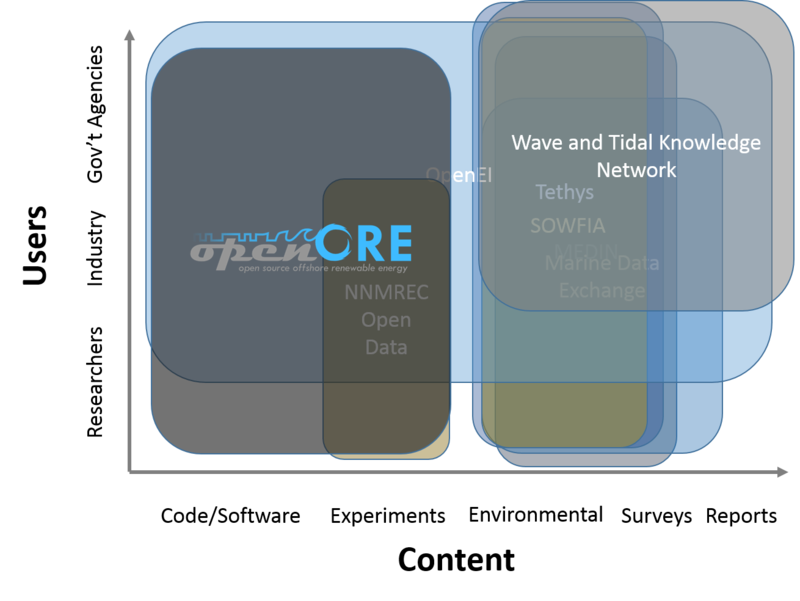 Wave and Tidal Knowledge Network – www.waveandtidalknowledgenetwork.com – Data exchange site for wave and tidal technologies run by the UK ORE Catapult. Content is industry focused and consists mostly of environmental data sets, surveys, and reports. NNMREC Open Data – nnmrec.oregonstate.edu/open-data – The US Northwest National Marine Renewable Energy Center hosts freely available data sets from experiments conducted by national laboratories. Marine Data Exchange – www.marinedataexchange.co.uk – Run by the UK Crown Estate, the Marine Data Exchange hosts surveys and reports for industrial ORE projects, mostly wind. Tethys – tethys.pnnl.gov – Tethys is a database of the environmental effects of ORE run by the US Pacific Northwest National Laboratory. SOWFIA – sowfia.hidromod.com – An outcome of the SOWFIA project was the SOWFIA Data Management Platform which aims to share European data on environmental and socio-economic effects of marine energy. MEDIN – www.oceannet.org – The Marine Environment and Data Information Network host a breadth of information on the marine environment.